The last few years have given rise to a new breed of people. They can be found at vegan coffee shops, using the Instagram app to take “artistic” photos of their coffee next to a book that looks interesting, so that they can tweet it to their friends. We call these people “hipsters.” When not in a coffee shop, you can also find them in record stores, letting you know why you shouldn’t listen to music unless it’s on vinyl, because digital music is an affront to your ears. Hipsters do tend to be fashionable, which is why I’m not surprised to see a company making glasses that are marketed to this specific demographic. Now don’t get me wrong, I understand the appeal of listening to vinyl. I just think that some people take it to an extreme. A company called Vinylize is more than happy to take money from these people however. By bonding a vinyl record with cellulose acetate, they are able to cut out the frames for a pair of glasses that will let everyone know just how much you love your records. 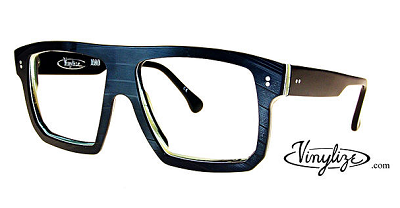 The glasses come in a variety of styles, including the classic hipster frames that you see above. You’re going to be paying a hefty premium on these, however. For a pair of sunglasses, you’re looking at around $440. If you want prescription lenses, you’ll need to send them an email for a quote. I actually think the concept of recycling old records is a great one, however, the price is going to be hard for all but the most fanatical of vinyl lovers.